How to Configure Management of Access Rights to the Content and System Resources? The settings will be implemented at the server side, from the control panel - Administrator Control Panel when functioning SL NEO server software. Login to the console is implemented locally from the server, or from any computer in the network by the address http://ip address:7901. You should login to the control console as an administrator. After login to the control panel, choose the item Status at the left part of the console menu. In the window SL NEO Storage choose the option Manage Users. You should login the window for editing the users list as the database administrator; if setting the access rights to the database was not implemented before, you should enter the username “admin” with no password. The window for control of the access rights already contains two types of users that have access to the database: admin and guest. If no settings were implemented before, these 2 types of users would have all possible rights by default. R – reading from the database, viewing clips, on-air broadcasting. W – recording and import of materials to the database. D – deleting clips from the database. As you have entered the editing window as an administrator, you can change the access rights for the user category “guest” and create new users. All these changes will be fixed in the server database and will be implemented for all network clients. We recommend not changing rights for “admin”, though you can set a password. Step 2. Setting the access rights for the database at the client side. For every client application (Air Manager, News Cut) installed at the network workstation, you may choose the type of user with appropriate access rights to the database, according to the list of users registered at the server (see step 1). Setting the username and password is implemented from the menu File/Configure, in the option Storage of the application Air Manager. Choose the item Edit and enter the username and password in the opened window. Now any user of the application Air Manager at the current workplace will have access rights to the database according to the settings that have been implemented earlier at the server platform. You can set up all the client stations in the network in the same way. By default, after the installation of Air Manager at the client station, the field “user” will be empty – it means that you work as a guest. The server module SL NEO Program Player allows work with playlists of every server playout channel simultaneously from several client workplaces. In some cases you may not need the possibility of full access to control of playlists executing from every computer with installed Air Manager. To prevent unauthorized editing the on-air playlists, you can set a codeword while configuring Air Manager. If this password is entered incorrectly, the playlist will be viewable in the read-only mode from the client station. All control functions, including playout and the possibility of editing the executable playlist will be blocked. The setting will be implemented from the control panel - Administrator Control Panel when functioning server software. You should login to the control console as an administrator. After the login to the control console, choose Manage at the left part of the console menu. 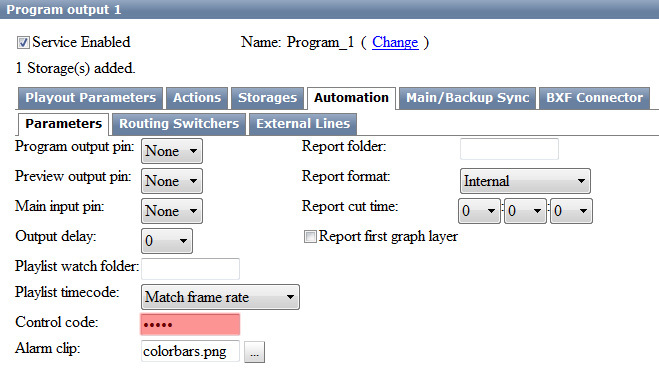 Then find the option Program Outputs in the window Program Output 1 and choose the tab Automation. Type the codeword in the field Control Code. Repeat this procedure for all other playout channels: change the parameter Control Code in the appropriate fields. Press Apply Changes at the upper section of the control console window. Herewith, all changed playout channels will be reloaded, playback will be suspended. In Air Manager the codeword for every playout channel (including its graphic playlists) should be entered into the column Passwd, in the tab for configuration of the services for playlist management: choose the option File/Configure from the menu, then choose the item Services. You can use the same way to configure other client stations in the network, if needed. All Air Manager users, without the entered codewords at the work places, will be able only to view the executable playlists. You may also set the password for entering the server control console. The setting is implemented from the control panel - Administrator Control Panel, you should enter the console as an administrator. There are two types of users for control of the server from the console: Normal User and Administrator. Normal User doesn’t have the right to implement settings, he can only view the settings and log-files, functions of stream switching and other operations in the menu option Status; he can also view functions of files loading in the menu option Files. The Administrator has the access to all actions. Setting the password for every type of users is implemented in the menu option Users.